Tandi Buchan, Megan Furniss and I left for Australia on 22 June with no real idea of what to expect at Improvention, a week long improv festival and conference, due to take place from 30 June – 7 July in Canberra. From the moment we arrived we were embraced with a real warmth and enthusiasm, and this continued throughout the week as we met more and more improvisors from around Oz and the world. We taught three workshops titled AmaImprov Afrika, which focused on improv beyond words, using body language and clear intentions to make scenes as opposed to relying on ‘funny’ wordplay in order to make scenes interesting. They were hugely popular and we received great feedback from all our participants, who seemed thrilled to be reminded of the benefits of ‘losing the words’. Besides the teaching of our own workshop, we all participated in workshops ranging from improvised film to long-form Western and the giving and receiving of notes. It was a huge privilege to be able to learn from our fellow improvisors and teachers, one of which was the legendary Patti Stiles. I took Patti’s workshop on the long-form Western and was absolutely thrilled to be cast in the show that was performed on the second-last night. More on that soon. Tandi, Megan and I all competed in the Maestro challenge heats, which took place every evening before the main shows. Every player gets a numbered bib, and plays with other randomly selected players in a serious of short-form games which are scored by the audience. After every round the players with the lowest scores are eliminated until only one remains, and they are crowned the Maestro winner. The five winners from each of the heats then went through to the Grand Final along with a number of ‘Wild Card’ players. After the same format, the ultimate winner was named. Although all our players were fantastic in their heats, I was very lucky to be made winner of my heat, and absolutely relished being in the Grand Final, which closed the festival. Bec De Unamuno from Sydney won the overall title, but we all had so much fun, there were no hard feelings. Besides the Gala Opening that was held at the Canberra Theatre on the first night, Tandi was invited to perform in Schnitz and Giggles, a series of TheatreSports-type short-form games as well as Rama Nicholas’ ‘Close to You’. Megan played in Glenn Hall’s ‘Locker Room’. We were so lucky to have each had the opportunity to play in shows at the festival, as this was certainly not our expectation. How lucky were we? All in all Improvention knocked our socks off. We saw incredible, inspiring and truly brilliant improv, such as Impro Melbourne’s long-form Noir drama ‘Fat City’, Nick Byrne’s musical ‘Crescendo’ and Jill Bernard’s infectiously energetic ‘I Jump, You Jump’. We played, we laughed and we made fast friends with hundreds of like-minded people from all over the world. Watch this space, as we start to play with what we learnt there, and bring it to life here in Cape Town. 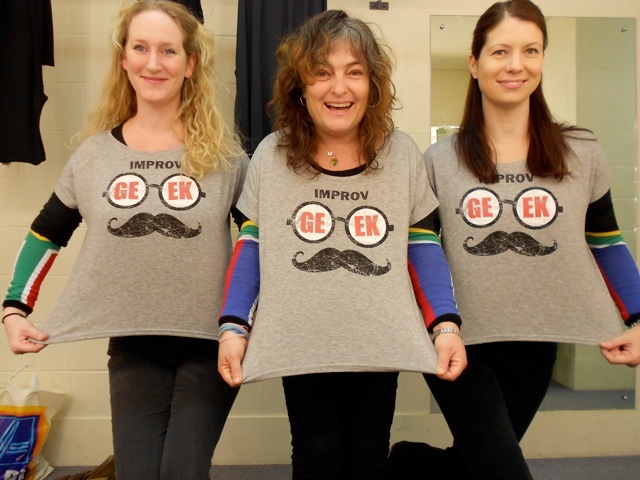 We also hope to have some of our Improv friends visit us and share their talents, so keep and ear open for interesting course offerings in the future. We can’t wait to share what we learnt!